Next to the other processes given here I have found The Completion Process as taught by Teal Swan to be very useful. This process can help with bad feeling emotions that you can get totally stuck in. This process really helped with some of the most difficult feelings that I hadn’t been able to transform yet. I would say that in general 95% of bad feelings for me were transformed by either doing The Work and/or Ho’oponopono on them. However there were some emotions I could get totally stuck in while I couldn’t really find a stressful thought behind them and doing Ho’oponopono on it didn’t really shift anything either. 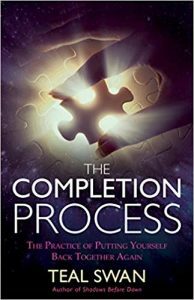 By going through all the steps of The Completion Process I really started to reconnect and process these bad feeling emotions and feelings. I found that these emotions and feelings often came out of the beginning years of my life and doing the completion process really helped me integrating some lost aspects of my inner child. First here an introduction of Teal Swan about The Completion Process. Then an example of how she is guiding a woman through this process. The process contains quitte a number of steps and I would really recommend people to buy the book or borrow it from the library so you can read it fully. Beneath here I copied the summary steps to go through but they work best as a summary for people who have read the whole book so they understand each step fully. This needs to be done only once. Exploring the feeling or trigger. Invite the Memory to Surface. To be done in first-person perspective. Validate the Feeling within the Memory. Step into Adult Perspective withing the Memory. Move from passively witnessing the memory to active visualization. Call Back Other Fractured Aspects of Self. Meet the Child’s Needs within the Memory. Choice to Stay or Go. Give the child the choice to stay within the now altered memory or go to the Safe Haven. If the child wishes to stay, repeat steps 10-12 if necessary and bring the process to a close. Once the child opts to go to the Safe Haven, continue on to the next steps. Enter Safe Haven and Deactivate the Memory. The memory the child was taken out of is then closed (shrunk or popped like a balloon). Do this for the child or children to create distance between the past and the present. Meet the Child’s Needs within the Safe Haven. Meet whatever needs the child may have within the context of the Safe Haven. If incomplete, repeat Steps 2-15. Option to Stay or Merge. Offer the child or children the option to stay in the Safe Haven or merge with the adult. All in all I have found this a very useful process to integrate any bad feelings that could suddenly come up without knowing what to do about them. Knowing The Completion Process I can simply go into them and transform and integrate them. Being able to do that really helps to get closer to and to maintain a state of inner peace.